Do you ever have one of those moments when you're in a drugstore and you see a new polish display, a bottle catches your eye, you pick it up, look it over, and then go "Ehh... it's not that cool." and you put it back? But then you can't stop thinking about that color, so you decide to get it next time you're at the store, only to find that it's the only color missing from every display? This one was one of those polishes for me. I thought it looked really cool at first glance, but then I thought it would be one of those deceptive drugstore colors where the duochrome effect in the bottle doesn't show up on the nail, leaving me with a plain, boring shimmer that I already have several versions of already. I probably picked this up and put it back four or five times before I decided that I had to have it just in case it was as interesting as it looked in the bottle. Of course, by the time I decided to get it, it was gone from every place I had seen it before. I did eventually find one last bottle of it and I'm glad I did! Okay, that was a long and pointless story. But come on... don't tell me you can't relate to that. 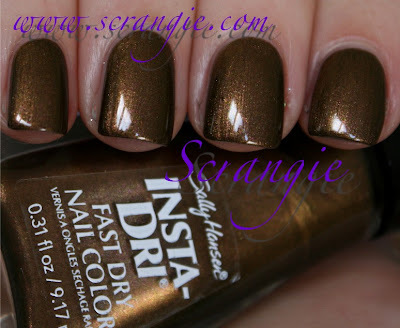 Sally Hansen Insta-Dri Fast Dry Nail Color in Bronze Ablaze. This is late fall in a bottle. It's a brown-based shimmer with lots and lots of hidden color in it. It shifts from neutral brown to golden brown like a duochrome, but it also has flashes and speckles of tons of other colors. Pink, red, gold, olive green and grass green, even a tiny tiny glimmer of purple here and there. Definitely one of my favorite drugstore polish purchases in recent years. Very complex and pretty. The only thing I don't like about it is the brush. It's ridiculous. I go through phases of liking and hating the Insta-Dri brush. If you've never used a Sally Hansen Insta-Dri, you're in for a surprise. It doesn't have a brush in the traditional sense... It has a spatula. Well, okay, it is an actual brush, but it's absurdly wide and flat, has an unevenly cut rounded edge and is very stiff. The stiff, flat brush tends to create bald spots at the base of the nail and pooling at the edge. It's not fun to use. But, if you get a good one that's cut nice and smooth, and it's in a color that's suited for this type of brush (like a plain opaque creme), it's great because you can paint your entire nail in one stroke. It's rare, but sometimes this brush works really great. Other times, it's like trying to paint your nails with a shovel. Wow, this post turned into one giant wall of text. Sorry about that. Cool color, though. Oh I bought this when I was in NY recently. It kinda reminded me of NARS Mash. I hope I get on with the brush better than you when I eventually give it, its maiden run. Haha, yes I can relate! I do that ALL the time! Glad you found this one, its so pretty:-) As for the brush....yuck, it kees me from getting this brand most of the time. I had similar experiences with the Wet n Wild brush I used last week. Very stiff, and the rounded/uneven bottom was definitely weird. I agree -- cool color! I totally agree with you about the brush thing. It does look kind of ridiculous and the application can be a bit tricky. Love this color anyway!!! Lovely color. I agree about the brush, just cant get used to it. Thx for posting. Now I'm dying to know what the brush looks like! I have this polish, and it will not dry. I was so disappointed. I'm wondering if I got a bad batch or something. I love the Insta-Dri brush, but then again I have rather large hands and nails. Different strokes (literally!) for different folks. Ah... I did this with this polish as well, and can't find it now! Funny! I had the same experience with this colour. Saw it, put it back, and then rushed back to get it. :) Although, I still haven't tried it yet since buying it. It looks smashing on your nails! Haha, and I laughed when you said that using the brush was sometimes like trying to paint your nails with a shovel! I hate how the... um... stem? of the Insta-dry brushes is shaped at odds with the neck of the bottle, so you can't do a very good job of scraping excess polish off the stem before you start painting, and end up with too much flowing down onto the brush as you try to paint. UGH! The shape of the bristles doesn't bother me nearly as much as that stem issue, but yes, I've notice that it pulls color off when you go over it more to even it out. Luckily (at least for the colors I've tried), the polish does self-level rather well, so the end result still works, even if it looks like crap when you're done with the brush stroke and think you're going to have to do another (or 18 more) coats to even it out. It truly reminds me of how I imagine a bronze dragon's hide to look. Awesome. I can definitely relate to that story. I'm one of the lonely few that actually likes the Insta-Dri brush. I love the way it covers my nails in one to two strokes. 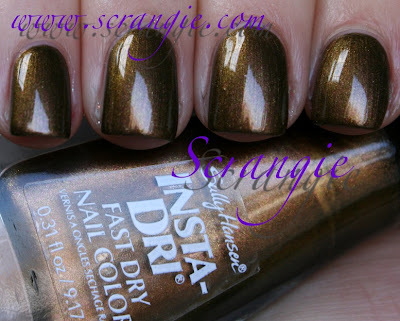 i love EVERY polish from this line (fall le instadri) they are soo pretty and I keep coming back to them. This is one of my faves for the Fall. Glad you found it again! i can so relate i do that all the time, so funny and this color is gorgeous hope i can find it. Scrangie - you always make me smile! I was going to ask - how do you do clean up when using a bad brush or gloppy formula? Your cuticles always look so neat. I tend to use an eyeliner brush with acetone. Hahaha that is my NEMESIS, the Insta Dri paddle brush. I hate that thing. The only thing I hate worse is the "new" NOPI brushes. I even like the mops that WNW is using for their quick dry line better! See, I LOOOOVE this on you. On me, I just hated it. I think I saw a tweet of yours that made me nab it, I found it in a clearance bin - and then I put it on and just - no. But on you, it just glows and looks fantastic! Okay, now that I've written a book in your comment section. I agree on the brush design, but the color is kind've amazing. The brush does drive me nuts also. I have a hard time with it for awhile. Maybe by the second coat I get better with it. I do love this shade. Have to see if I have it. If I didn't write it down in a book I wouldn't know what I had. I have done the same thing but online. I spend an hour looking at polishes & putting them in my cart. Then after all that I canel the whole order. Finally I might order it after 2 or 3 times. 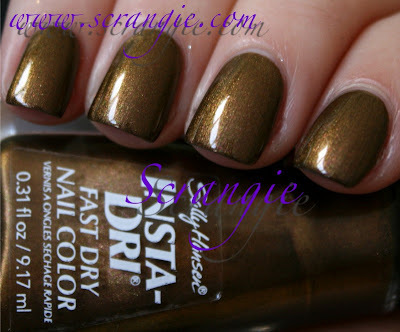 I bought this colour a few weeks ago at Target, just because it was on sale-$2.37, or something. Less than $2.50 for a nail polish? I'm game! So I bought it, not expecting a whole lot out of it. Seems like I got one of the better brushes, because I actually don't mind the brush at all. The colour itself is...spectacular. Really, really, really beautiful. 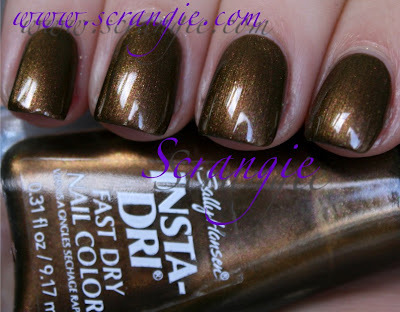 It's a deep bronze tone that can look like a golden olive green in certain lighting. And the best part? I painted my nails on a Thursday, and repainted them on Tuesday. Only the most minimal tip wear, and it maintained its glossiness the whole five-ish days. I only repainted them because the growth line irritates me. HIGHLY recommend this polish. Beautiful color! I have Insta Dri Mochachino and it's a redder brown. I want this one too! I just love those fall colors. I know what you mean about loving and hating the brush. I like it in terms of being able to evenly coat my nail quickly, but when it comes to the edges it's hard to avoid getting polish on the skin so cleanup is definitely inevitable. I've used one Sally Hansen Insta-Dry in Grape Growing!, a pretty purple/blue duochrome, and the brush surprised me as well. Your comment about the brush being a spatula made me laugh! SO true! lol This is a gorgeous color. Scrangie, sadly this color took on more of a greenish tint on me. I wish it looked like that on me. The only good thing I can say about the brush, makes a quick pedi pretty easy. 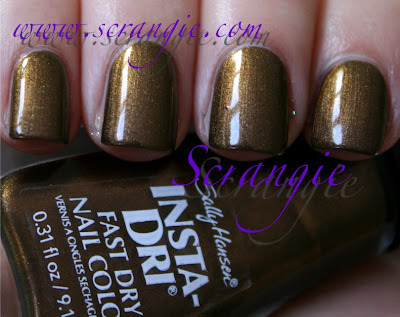 Ooh, I love Insta-Dris, but I've never seen this color at the stores I frequent. I'll have to be on the lookout! I passed this color in store and did not buy it--BECAUSE OF THE STUPID BRUSH! (Are you reading this Sally Hansen?) I hate that thing with a passion! and I hate insta-dri because it toys with my emotions! I always fall in love with the colors but have to pass because of the brush ... well, the formula is pretty craptastic too, quite gloppy. And now SH has started putting these brushes on their other polish lines too! Stop the madness! I had the exact same experience with this polish! Kept picking it up and then putting it back. Then finally I bought it and it's my NOTD now. It's so pretty!